Even the most careful individuals are likely to end up with stains on their dining room chairs eventually. During dinner parties when the table is crowded or during family get-togethers when the little ones are present, accidents are more likely to occur. Fortunately, the spills on your dining room chairs do not have to become permanent stains. With the right products and a few simple steps, your chairs will look as good as new. Before applying any cleaning products to your dining room chairs, it is imperative to check the cleaning code of the fabric. This can usually be found on the underside of the chair seat. An "S," on your chairs means that only a cleaning solvent made for fabrics should be used to clean the spot because water will cause the color in the fabric to run. A "W" on the chair indicates that the fabric should be cleaned only with water. An "SW" indicates that either detergent or water can be used. Most common fabrics used to cover dining room chairs will be "SW." If the chairs do not have a cleaning code imprinted on them, test any cleaner on an inconspicuous area of the chair first to check for color-fastness. Allow the spot to dry before proceeding. If the fabric allows, apply a stain remover used for laundry or upholstery directly onto the affected area. Allow the cleaner to penetrate the stain for at least fifteen minutes. If the fabric is water-safe, use a damp white cloth to blot the stain. Use your knuckles to push forcefully into the fabric. If the fabric should not be touched by water, use a dry white cloth. While blotting, do not rub the fabric, as it can weaken the fibers and lead to premature wear. If the stain is not completely removed in one treatment, apply additional cleaner and wait fifteen more minutes before blotting again. 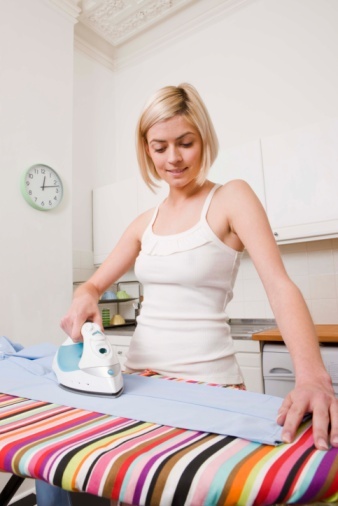 If your fabric can only be cleaned with water, try blotting the stain with a damp cloth. Dining chairs made with this type of fabric will likely need to be treated by a professional upholstery cleaner. To avoid future spills penetrating the fabric, consider laminating the fabric on your dining room chairs. This can be done at any professional upholstery shop. Or for a quick fix at home, purchase dining room chair covers that can be slipped on and off with ease. Anytime a spill occurs, simply toss the cover in the wash.
Gail Logan is a magazine editor and freelance writer based in Atlanta, AL. She received her B.A. in Journalism from Patrick Henry College. For the past four years, she has written home design, travel and food features for national magazines, including "Coastal Living," "Texas Home and Living," "Log Home Design," and "Country's Best Log Homes." When not writing, she mentors inner-city children. How Do I Clean Fabric Office Chairs?